Stop-Trump groups spend millions on ads. But is it too late? On the day before Super Tuesday, more than half of all the GOP-related campaign ads on TV were anti-Donald Trump ads. The attack ads played more than 4,000 times on local broadcast stations and national cable channels, according to Kantar Media's estimates. Just one day's worth of saturation messaging cost the anti-Trump groups $5.9 million. The spending gives a big boost to local TV stations and their cash-strapped newsrooms. Will it give a boost to Trump's rivals, too? Or did it come too late? When the election results come in on Tuesday night, political pros will be looking for signs of the ad war's success or failure. In light of Trump's electoral success, largely through unpaid press coverage rather than paid ads, strategists have been debating the effectiveness of old-fashioned TV ad campaigns. But at this point in the primary process, Trump has been buying airtime too -- $4.7 million worth in the five states where voters are going to the polls on Tuesday. His opponents have been spending a whole lot more. Conservative Solutions PAC, which supports Marco Rubio, has spent $13.1 million on ads in the five states. The American Future Fund, which supports John Kasich, has spent $6.2 million. "It's wall-to-wall TV ads" in Ohio, Henry Gomez, the chief political reporter for the Cleveland Plain Dealer newspaper, said on Sunday's "Reliable Sources." "This morning, as I watching local news, I don't think I saw a nonpolitical ad among them." It's not just the GOP: Gomez noted that viewers are being "inundated" with ads for and against Hillary Clinton and Bernie Sanders, too. In Ohio, in fact, the Sanders campaign spent $2.5 million and the Clinton campaign spent $1.9 million in the week that began March 9. Trump spent $1.2 million, while his principal rival in the state, John Kasich, spent $750.000. Most of the stop-Trump spending has been coming from conservative super PACs like Our Principles PAC, which produced a buzzworthy ad showing women reading things Trump has said about women. The ad, released on Monday, has received a huge amount of press attention on top of the $500,000 the group says it is spending to air it on cable. 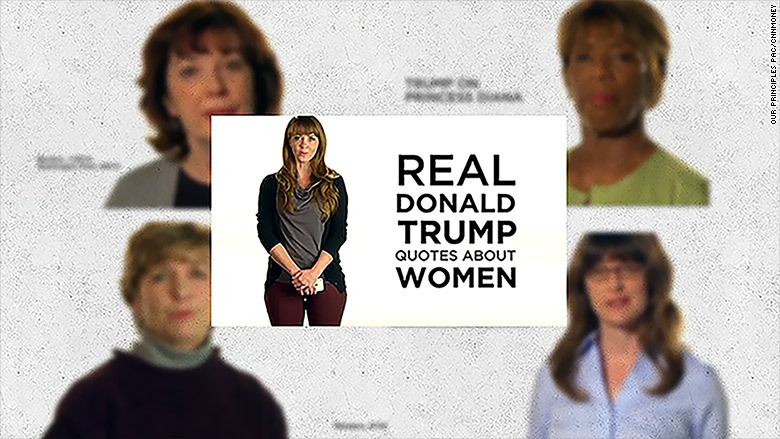 Our Principles PAC produced a buzzworthy ad showing women reading things Trump has said about women. Kantar's data shows that spending on anti-Trump ads has steadily increased in the past month. 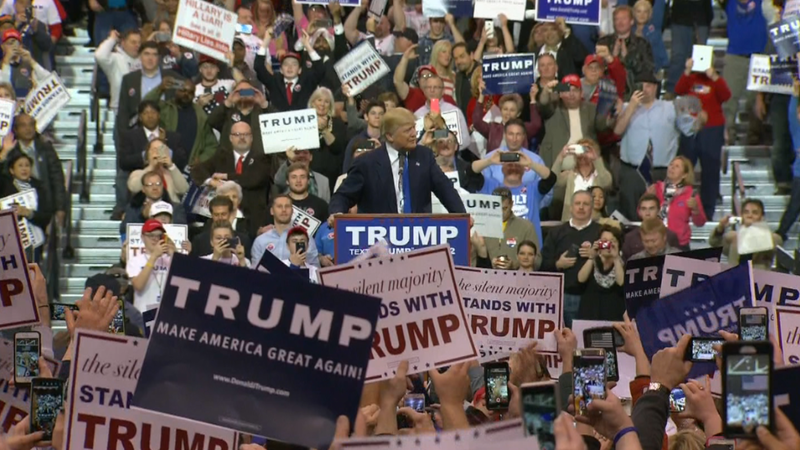 It surged at the beginning of March after Trump won pivotal victories in the first Super Tuesday set of primaries. "On March 2, the lightbulbs went on," Elizabeth Wilner, the senior vice president of Kantar Media Ad Intelligence, said. During the first week of February, 9% of GOP-related campaign spots qualified as "anti-Trump" spots, according to Kantar's analysis. During the first week of March, 47% were "anti-Trump." The week before the March 1 primary, $7 million was spent on anti-Trump messaging. The week after, $12.8 million was spent. Not surprisingly, the sheer number of ads on TV have increased. The ads are a predictable boon for TV stations in states with competitive primaries. To a lesser extent, the ad spending also benefits the operators of local cable channel systems and the owners of national cable channels.